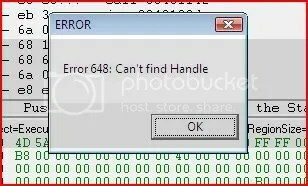 Once again, this reverseme was downloaded at http://www.osix.net/modules/geek/reverse.php, a challenge site. 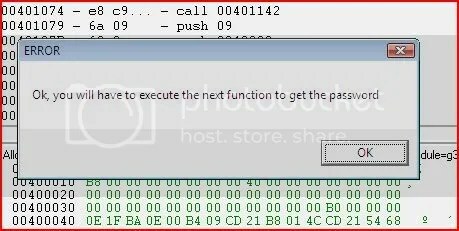 Attached to this thread is the target we are reversing today (g3.exe) and also a patched version of the target (g3-2.exe). 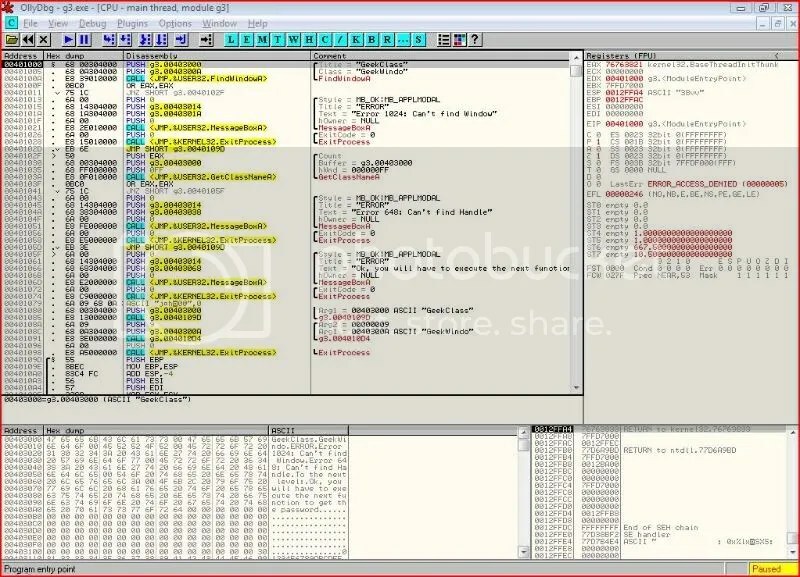 By the end of this series you will learn how to do simple patching, modify flags to control code execution, modify register values and also learn how to completely remove an API call from an executable. Uh oh. This can’t be good. As soon as we click “OK”, the process terminates. Notice that the only way a 0 can be produced is if both starting bits were zero to start off with. And it turns out EAX at that point is always zero. Therefore the result of the instruction at 0040100F will always be zero. The first method would probably be a little messy and I’d rather avoid it at this point in time. Instead let’s find out how we could change the state of a flag. A flag has 2 states, either set or clear. 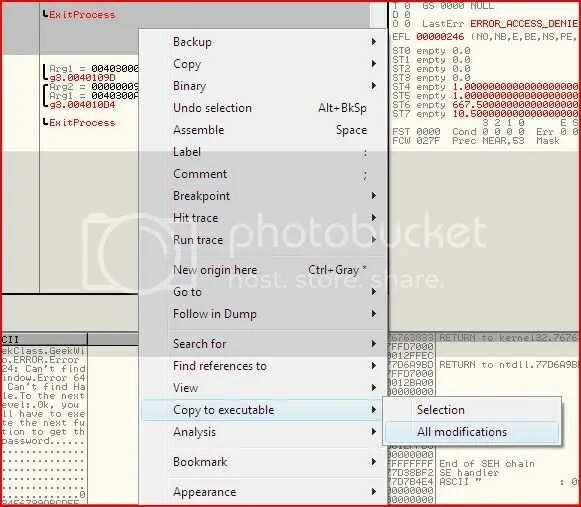 One of the 32-bit registers of your processor, namely EFLAGS, holds a number of single-bit boolean values. One of these bits holds the value of our zero flag so if we were able to change its value at run-time, we could temporarily control the code flow. 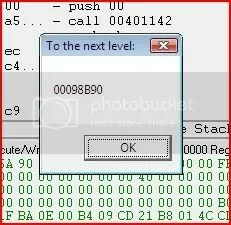 In the assembly language, whether a conditional jump is taken is dependent on the status of a certain flag. Strictly speaking there is one exception to this rule and that is the jump JECXZ. This jump is taken if ECX = 0. I can’t say I’ve ever seen this before though. Now let’s give AL the value of 9 and BL the value of 8. 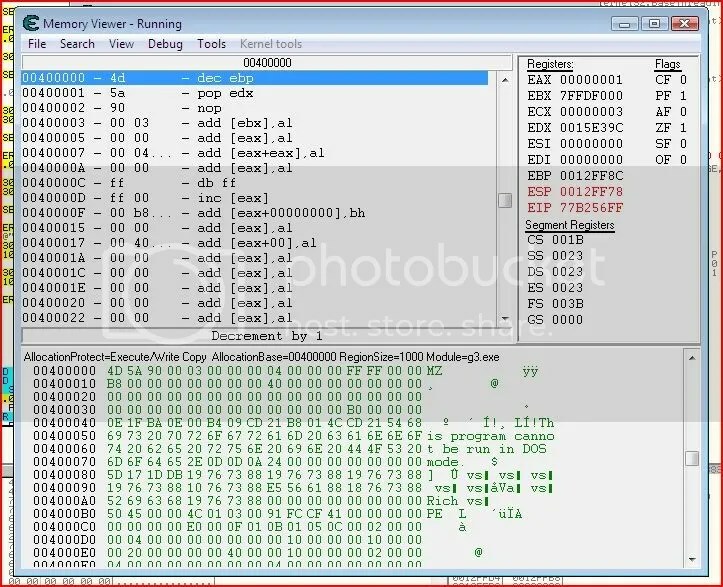 When your processor compares these operands, it can see they are not the same (there is a difference). Therefore the zero flag is not set/is clear. If we tried the same compare except AL and BL both had the value of 8, then the difference is 0. 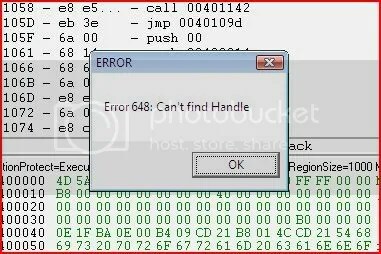 Therefore the processor will set the zero flag. So at our conditional jump, we want the zero flag to be clear. I will now show you how we can change the state of a flag at a certain instruction. I will be coming back to the third option later. To change the state of a flag at any point in an application’s execution, step the code until you are at that instruction, go to the relevant flag in the registers window and right-click it and choose “Reset” or “Set”, whichever one is relevant. 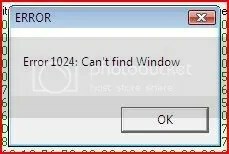 Alternatively, select it and press enter or just double-clicking it will change its state. 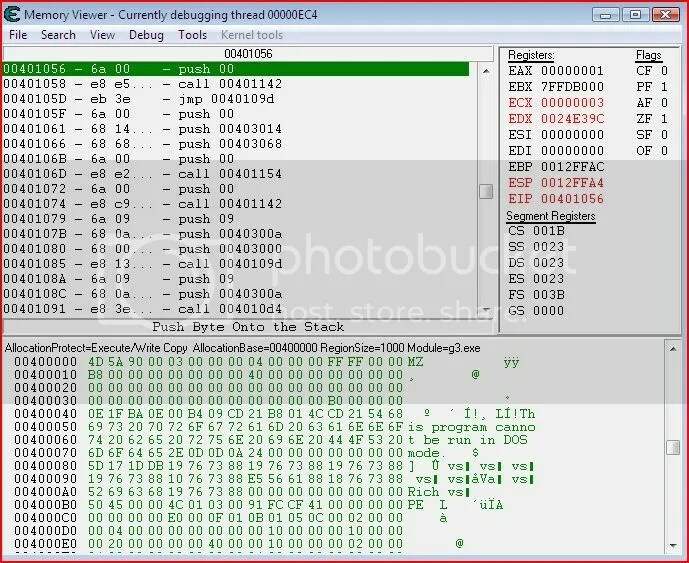 I have now cleared the zero flag at 00401011 and you can see that Olly tells us that code execution will jump past the calls to the bad message and process termination. 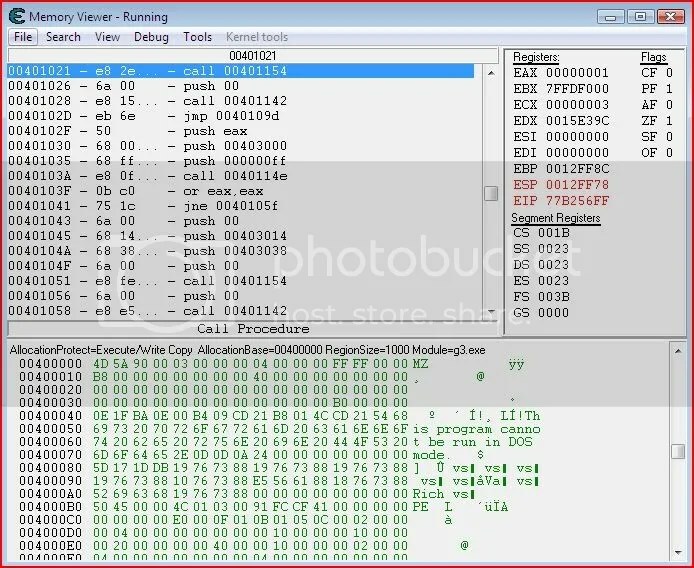 So far we have mainly been dealing with only a few registers that hold values because the programmer made them do so. 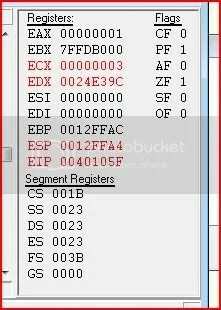 I will now introduce you to the 32 bit register EIP. 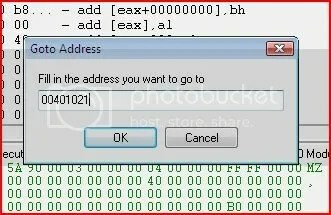 EIP points to the address of the next instruction to be executed. 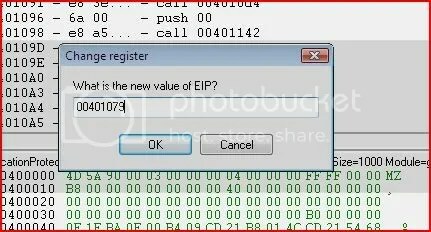 Since that instruction has not yet been executed, EIP tells us that the next instruction to be executed is 0040106D. Update is here. 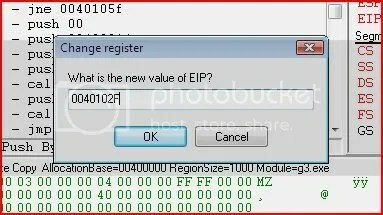 You can in fact change EIP through OllyDbg Step up to the address that you want to change it at. 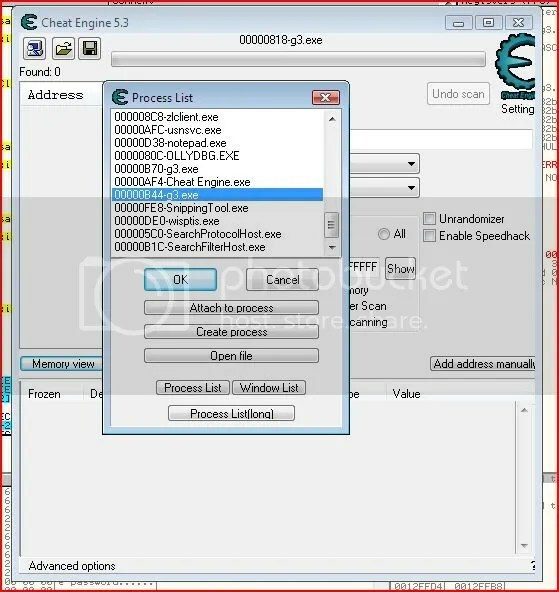 Then find the new address you want EIP to be. 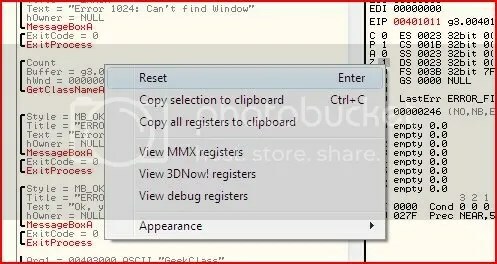 Right-click it and click “New Origin Here”. 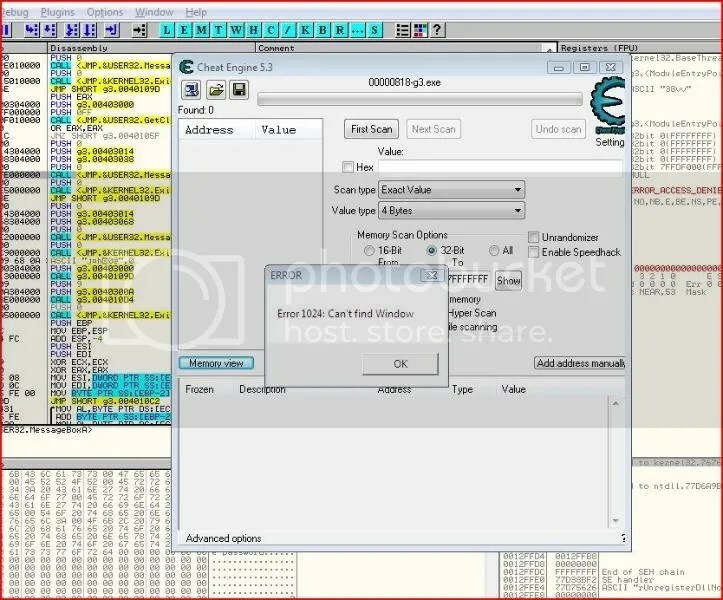 Now then I’ll advise you right now that Cheat Engine’s debugger is not very friendly. If you don’t know what’s going on there are no helpful comments like OllyDbg. For this reason I will be running Olly beside CE. Now then, it’s definitely possible to change the state of a flag using CE but you already know how to do that with Olly. 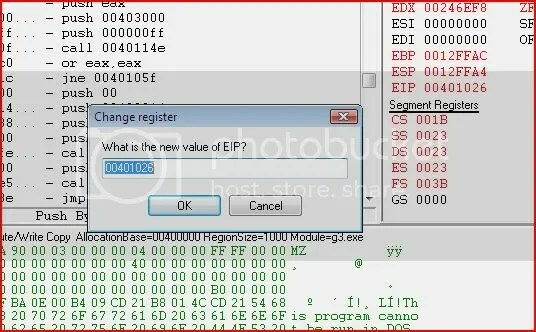 So let’s do exactly the same as we did in Olly except do it by changing EIP (ie. 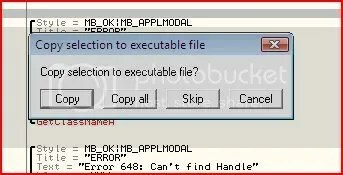 telling the application what the next instruction it is to execute will be – hopefully not ExitProcess). 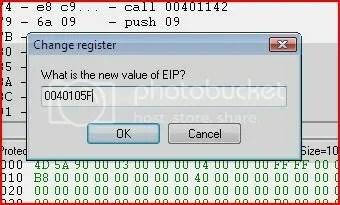 So we’ve now fooled the application into giving us what we want and along the way we’ve found out what EIP is and how we can change it to temporarily alter the execution flow. But did you notice that everything we’ve done so far has been temporary ? Well that’s all about to change as we proceed to try out the third option I suggested (negate conditional jumps). We’ve finished with CE for today so you can close it down. I will now show you how you can patch an application so you can save your changes and make the code flow the way you want and stay like that ! We have several options here. Two of those options are to overwrite the ExitProcess call with an unconditional jump to the message box showing the password later on. Hell, we could overwrite the call to the message box saying “Ok, you will have to execute the next function to get the password”. But I’d like to introduce a new method. Instead of writing our own instructions in to do something, we will write instructions in to do nothing. In assembly, an instruction like that is called NOP, or no operation. 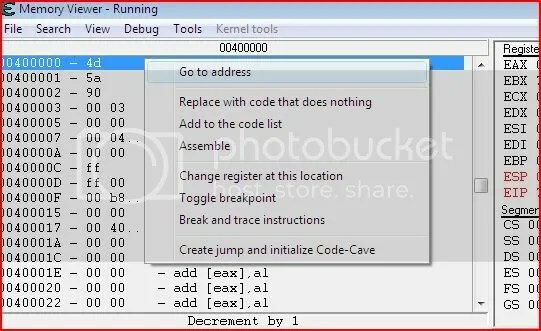 Quite simply when the processor sees that instruction, it will not perform any operation. So what we need to do is to NOP out the two lines that call the ExitProcess function. 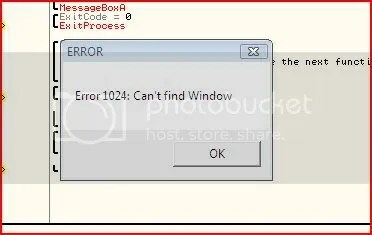 Then the processor will skip right over those lines and go straight to our good message box.